Increase Sales with Better Customer Data Track customer contact info and purchase histories automatically. It’s easy to stay in touch and use customer loyalty tools to keep them coming back for more. Basic Inventory Management Software to Increase Profits Point of Sale automatically adjusts your inventory every time you make a sale, order, or return — which helps you keep the most popular items on-hand without overstocking or selling out. 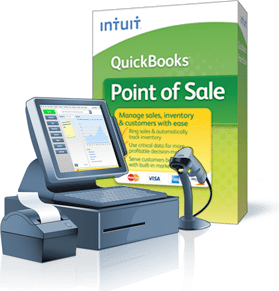 Ring Sales Faster and Integrate with QuickBooks Accounting Point of Sale makes the things you do every day, from ringing sales to bookkeeping, fast and easy. Save Time and Money Accepting Credit Cards with integrated merchant service from Intuit, there’s no double-entry between your terminal and software and you don’t need to buy or lease a separate terminal to take credit and debit cards. Get the hardware you need for a complete point of sale solution. Barcode & POS provides QuickBooks POS Software and barcode solutions to commercial businesses across the greater Atlanta, GA region.